1904 (Absolu Eau de Parfum) is a popular perfume by Histoires de Parfums for women and was released in 2015. The scent is powdery-floral. It is still in production. 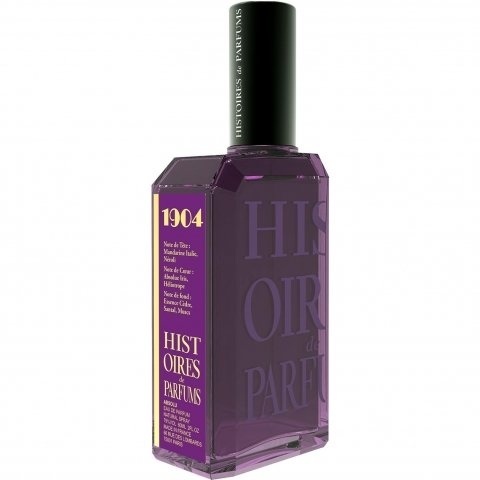 This is a variant of the perfume 1904 (Parfum) by Histoires de Parfums, which differs in concentration. Histoire de Parfums always refers to a special event with the names of the fragrances. So at "1904 Madame Butterfly Puccini Absolu" (so the complete name) on the premiere of the opera "Madama Butterfly" in 1904 at Milan's Scala. This name leads me first to the "land of cherry blossoms" with its fragrant equivalents, but I hadn't thought of a trip to Tuscany. Giacomo Puccini had gotten to know "Madame Butterfly" as a play in London and was so taken with the material that he sought opera rights. The premiere on 17 February 1904 in Milan's Scala was not very successful. Neither critics nor audience could be convinced by the original work. Only after a three-month reworking of this work, which Puccini himself considered his best, were audiences and critics won over. For me personally Cio-Cio-San, called "Madama Butterfly", a daughter of the traditional Japan and the American lieutenant Pinkerton serve the cliché of the colonialism prevailing at that time somewhat colorlessly However, in Italian opera I also prefer Verdi's powerful sounds to Puccini's sometimes somewhat "tone loops rich" sounds. So I tested "1904 Madame Butterfly Puccini" somewhat preloaded and landed in the flower- and fragrance-rich Tuscany. The prelude with lively, a little chemically smelling mandarin, combined with balancing neroli nuances, would still serve the subject of the Far East well. It contains something tender, innocent, soul touching. But that was it: in the further course of the fragrance we say goodbye to the tender and vulnerable woman. Vanilliger heliotrope, which appears dark violet in colour and tone alone, confidently conquers the fragrance stage: "Look here, it's me"! He dominates them until the moment when the power of the iris attracts full attention! Iris-Absolue jumps at me full of violence; her heavy powderiness makes me gasp for air. It's not the first time I've experienced this encounter: we've both had to fight many a fight together. I think the final score is currently "Pari"! For lovers of powdery-flowery, a little dark fragrance beauties, "1904 Madame Butterfly Puccini" is already a great discovery. Moschus reinforces this powder effect even more: two fragrances of strong will have been harmoniously found here. Finally, sandalwood and cedar wood play only an additional role in this scent composition: they skilfully replace the great choir in the opera. Yeah, "1904 Madame Butterfly Puccini" is great! This fragrance is a tone-powerful painting, which impresses, fascinates - but which lacks the fine nuances with me. In painting and music it is precisely these "trivialities" that often make up the special attraction. As I said: "1904 Madame Butterfly Puccini" is a great fragrance for the self-confident and strong woman. He crushes me and I have to be there: Iris-Absolue won this round against me - I'm painting the sails a bit exhausted! It's just too much power, too much power - I'm missing some of the "loops" of Puccini's music here. I don't know to what extent the name influenced me here, already steering the senses in a completely different direction. I had expected other: I am overwhelmed with this effect. Fortunately, this powerful powder/flower mixture leaves me quite soon; pleasantly discreet. What remains is a breath that now pleasantly touches me again. Perhaps I should once again devote myself to Puccini's detailed operas. Only I'm afraid it would be "Tosca", who enjoys my greater sympathy by the performance in the Arena di Verona many years ago. Evviva "1904 Madame Butterfly Puccini"! Write the first Review for 1904 (Absolu Eau de Parfum)!